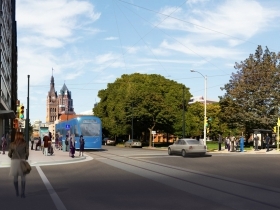 The Milwaukee Streetcar starter system has been approved. After more than 40 committee and full council meetings and years of debate, the Milwaukee Common Council has approved the $123.9 million, 2.5 mile starter system. Mayor Tom Barrett had first proposed the system in 2007 and the council had approved engineering work on the streetcar project in July 2011. Today’s vote follows a November 18th announcement by the mayor of his desire to move forward on the project. The project had been seemingly dormant before that following a state law designed to saddle the project with additional costs. 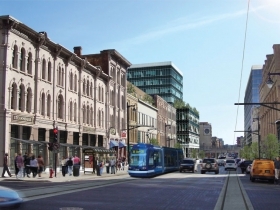 The mayor’s case for the system was aided by a number of big ticket projects in the works, including the proposed The Couture at the east end of Michigan St. (which needs a transit component to avoid repaying $8 million in federal funds), a proposed Johnson Controls office tower for which the company has expressed a desire to have a streetcar connection and a number of new apartment projects across the city. The proposal has received increasing support from the business community, culminating in a press conference held at Manpower Group’s global headquarters yesterday. The approval clears the way for the city to finish engineering work, procure vehicles, build the system and begin operations in 2018. Today’s vote was an unusual one in that it was a negative vote to move the project forward. This was triggered by an unusual parliamentary move used at the prior meeting on January 21st by alderman Tony Zielinski. The Bay View alderman voted in favor of the project, then moved to reconsider his vote and enter the file into the journal of proceedings. This required three votes to do, which it received. Today, the council needed an eight-vote majority to reconsider the project, which it did not receive. 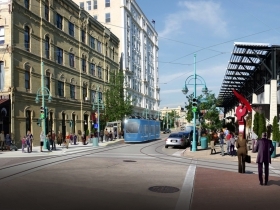 Streetcar supporters voted against reconsideration, thereby approving the project. The final tally of council members thereby approving the project included nine: Robert Bauman, Milele Coggs, Ashanti Hamilton, Nik Kovac, Michael Murphy, Jose Perez, Russell Stamper II, Willie Wade and Terry Witkowski. Voting against the streetcar were Jim Bohl, Joe Davis, Robert Donovan, Joe Dudzik, Robert Puente and Zielinski. Because he voted for the project previously to allow his move of reconsideration, Zielinski will be recorded as a yes vote on the project despite his opposition. Donovan remarked that “it’s rather disingenuous of the mayor and some of the proponents of the streetcar to talk about where it’s going to be expanded to without mentioning how it’s going to be paid for.” Donovan also pleaded for civility following the issue, noting that Bauman has closed his office door, which obstructs Donovan’s ability to get quickly to the coffee machine. Davis spoke at length about his workforce accomplishments and railed against those who had attacked his “YouTube video.” Davis also attacked Urban Milwaukee’s council contact form, which he derided as “fixed.” The form received more than 3,250 submissions, with 75 percent in favor as of 7:00 a.m. today. No supporters spoke on the matter on the council floor. The referendum petition drive will continue until March 5th as it’s legally allowed. The referendum petition drive needs to gather 31,500 signatures, of which proponents have recently claimed to have 16,273 signatures. Even if the signatures are turned in by the March 5th deadline, anti-streetcar proponents will be too late with their petitions to get the referendum on the April 2015 election ballot. This would push the first referendum (whether or nor to require a referendum on any rail transit projects of $20 million or more) to the February 2016 election, and assuming a majority voted yes, would then hold a second referendum (an up or down vote on the streetcar) in the April 2016 election. As my colleague Bruce Murphy has written, that may make the whole exercise moot legally, but streetcar opponents may be okay with this, as it forces a hot topic issue onto the mayoral primary and general elections, perhaps driving up the turnout of streetcar and Barrett opponents, which would help mayoral candidates Davis and Donovan. 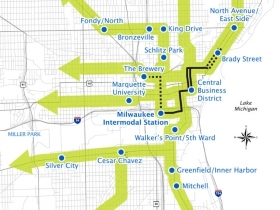 The project will be funded with $54.9 million in federal funds, first designated for transit in Milwaukee in 1991. In addition, the city will provide a 20 percent local match ($9.7 million) from the existing Cathedral Place tax-incremental financing district. Due to a change in state law requiring the city to pay all utilities cost and the addition of a spur to the lakefront, the cost of the project increased to $123.9 million following extensive engineering work. The council approved the additional funds to come from a new E. Michigan St. TIF district ($31 million) and amended a Third Ward TIF district ($18.3 million). In addition, the city is pursuing an additional $10 million federal grant to pay for the lakefront spur. The cost to relocate the utilities for the streetcar project has been an extremely contentious issue. Initial cost estimates put the relocation expense as high as $70 million. A legal challenge continues by the city attorney against the state Public Service Commission regarding its decision that the city must pay the entire cost of relocation (which would be unique to public works projects in this state). But the mayor has noted repeatedly that city engineering work has already reduced those costs by nearly $50 million. As of today the relocation costs for the project would be $22.7 million. Barrett has noted that the utilities (of which the biggest is We Energies) have indicated a number of minor route modifications that would drive down utilities costs by millions more. The mayor stated that the city is actively working on those modifications as part of its engineering work. “I am 100 percent confident that number is going to come down by millions of dollars,” Barrett said during a committee meeting in December. The city has already received a federal Congestion Mitigan and Air Quality grant to fund 80% of the first 18 months operating cost ($3.18 million). The Barrett administration believes they can get that grant extended for another 18 months, meaning that the city would not have to pay the full costs to operate the streetcar until 2021. After the grant runs out, the city will pay for the system using a combination of fare box revenue, advertising, corporate sponsorships, operating agreements with partners and revenue from the city’s parking fund. It is expected that the total cost would be $2.65 million a year to operate the system, with fares contributing $560,000 and sponsorship contributing $270,000. The project was originally to be financed with $64.6 million in federal and local funds. An 80/20 federal/local split would have leveraged federal funds first awarded to the city in 1991 to build a regional transit system. Numerous political deals have reduced that original $289 million to $54.9 million today, including funds for new buses for MCTS, removing the Park East Freeway spur, rebuilding the Marquette Interchange and replacing the 6th Street Viaduct with two bridges. The streetcar project itself has gone through numerous iterations, with former Mayor John Norquist proposing to build bus-only lanes on Interstate 94 and a light rail system to Waukesha County (both killed by regional politics), the Common Council proposing to build a electric bus system in 2006 (vetoed by the mayor) and Mayor Barrett originally proposing a downtown streetcar loop in 2007. The current route was proposed in 2009 by the mayor, with minor modifications made since to avoid key utility intersections (such as the intersection of N. Broadway and E. Mason St.). The Common Council on a 10-5 vote approved the project on July 26, 2011, allowing the project to move from 30 percent to 60 percent engineering completion before it would need to come back for final approval. Final engineering will proceed immediately. Construction is slated to begin by the end of 2015 and would continue for the next two years. Project proponents have repeatedly stated that although the construction would take two years, to minimize disruption the entire route would not be under construction at once. Vehicle selection and procurement will happen this year. The system would enter operation in 2018. The replacement for the Bradley Center has become a hot topic with the announcement of $220 million in bonding being proposed for inclusion in the state budget by Governor Scott Walker. The likely location of a new arena at N. 4th St. and W. Juneau Ave. places it directly in the approved path of the streetcar. Following today’s vote, Alderman Bauman remarked “we may very well see an extension of the streetcar as part of the arena.” The streetcar has an approved and engineered route of 3.6 miles, of which 2.5 miles are being built following today’s vote. The engineering for the longer route will lower the cost and shorten the timeline of future extensions. During a December committee meeting, Department of City Development commissioner Rocky Marcoux said the city would look to issue a request for proposals for planning route expansions in early 2015. Alderman Bauman has been the leading advocate for the proposed system since its inception and has been very vocal on the topic for years. In a media scrum following the vote, Bauman chastised the behavior of project opponents, particularly alderman Davis noting “opponents have intentionally distorted facts.” Bauman remarked that “Davis has been misrepresenting tax incremental financing for two and a half months… Diversion does not existing in the world of tax incremental financing.” He noted that Davis has approved over $200 million TIF districts prior to this one, and never raised a concern about Milwaukee Public Schools before. Bauman, remarking that he would say it on the record so everyone understand, stated “there is no diversion from MPS for this project.” Davis’s claims about the streetcar diverting funds from Milwaukee Public Schools was given a Mostly False rating by Politifact. Tackling another hot opposition issue, that of streetcars running in snow, Bauman stated “they’ve been running in snow for over 100 years.” He noted the past systems that were ripped out ran in snow and has repeatedly offered up Toronto’s large streetcar system that operates in a cold weather climate. The Mayor intends to sign the legislation approving the streetcar at a ceremony today at the Pabst Theater. The ceremony will take place at 3 p.m. and is open to the public. The mayor will be signing four files that authorize the project, 141313, 141263, 141264 and 141323. Video from the Mayor’s signing ceremony is now available. Well, glad that’s finally settled. Now all the bickering can stop, right? I don’t get a vote in the race for Mayor, so I hope Milwaukee see’s the project through. Otherwise we’ll be known as the place to get like new rail vehicles (because you just know the first thing Mayors Donovan and Davis would do is cancel this thing mid-construction). About time. If anything, this circus orchestrated by Bob Donovan has proven that he doesn’t haven’t nearly the support he thought he did. I hope this is the beginning of the end of Bob’s, Joe Davis’ and (especially) Tony “Bones” Zeilinski’s careers. Dave, actually once the real numbers come out and we all see the proof of Tom Barrett’s lies, I hope this is the beginning of the end of HIS career. He has lied repeatedly to support this idiocy and is neglecting the city so that he can have his shiny new toy and give OUR money to his rich development buddies. TIF money is money that would otherwise go towards things like police and fire departments, MPS, road repair, etc. At a time when crime (including murder) is rivalling Chicago, roads are in worse shape than ever before, and MPS graduates are pathetically undereducated is absolutely the wrong time to waste so much money on a problem that could easily be solved by far less expensive means. This is gross irresponsibility on the part of the mayor, and I hope it wakes people up and costs him the career he very much does not deserve. Do we know what the operating pattern will be? Initially it was just a simple end to end line (from essentially 4th/St. Paul to Prospect/Ogden). Now, though, there are essentially 3 legs. It’s nice to see that in Milwaukee, progress trumps politics! Milwaukee will soon have a necessary fundamental component of any vibrant urban area. Any inference that suggests NOT building the system equals an increase in police an fire service, increases in public school performance, increases in road quality, and decreases in violent crime are completely off-base. These are real issues, why would anyone think by not building this system all of these issues go away? Nothing would change, nothing will be different than it is today. The money to spend to improve all of these issues doesn’t exist if the project doesn’t move forward, that is why nothing changes if the project doesn’t move forward. If anything it funds the future of these issues when the TIF expires, as a true investment does. TIF’s occur regularly in many cities, these are no different. I’m not sure why this topic isn’t so aggressively debated for every TIF. I will go back to my first sentence to simply state why am in support of the system approved today. TIF money is money that would otherwise go towards things like police and fire departments, MPS, road repair, etc. No, TIF is a way to tie bonding to a specific project and connect that bonding to the value generated by the investment. If anything, it’s a better guarantee that the debt will be repaid. Alternatives would’ve been to put this entirely on the property tax or the sales tax, but those are constrained by the state. To all those who offer up the the diversion argument: Are you really asking for more money for the examples you cite (schools, roads, firemen, etc). If you are, let you representative know and they’ll be happy to raise your taxes. Do all of those entities want or need more money? Sure, but part of responsible governing is balancing current operations with future investments. If cities don’t invest in themselves, they die. Rich – That’s about as succinct and focused a rebuttal that I’ve heard to those presenting the diversion argument. Very well said. Sadly, some 16,000 people have been lead to believe otherwise. I hope the Mayor and other elected officials pro-actively stay on message for the next 30 days. It’s important for those who’ve been completely mislead to hear the facts. Wow… Lets start putting up payphones now! The freeway could have been expanded through downtown for this price. Poor decision Milwaukee, keep yourself in the red! This reminds me of the monorail episode from The Simpsons. While its possible they haven’t collected a single signature since 1/23/15, its more likely that they have been fudging the numbers whenever it seems useful. Gary……. not that big of a deal. It’s simply improved infrastructure for residents. I have to assume you’re joking about freeways through downtown-we have plenty of those. Time will tell on the streetcars, but I think we’ll all have our own measures for success. I think they’ll do great, especially as they’re expanded and integrated with the bus system. @Gary Sinise It’s facile to support your insinuation that Milwaukee indulges in profligate spending with a cartoon show. If you consider the relevant facts, instead of some bizarre association you managed to make between reality and fiction, you would know that Milwaukee’s fiscal history demonstrates extremely prudent governance, especially in comparison to the State of Wisconsin. @Gary, if I had my way, I’d tear down the freeway east of the 43, and make Tosa to Delafield and Whitefish Bay to Port Washington a toll road. Streetcars are indeed a sign of progress, where currently the advanced mode of transportation is a horse and cart. The winners in this are the streetcar manufacturer, contractors, and the banks who will borrow millions to the city for cost overruns. Surely fixing up the countless areas more deserving of TIF funds will be the low priority for the next five years when these streetcars are out clogging traffic and causing accidents. Urban Milwaukee will not be gentrifying anytime soon with these visionaries at the helm. High taxes, high crime rates, poor schools, but the poor kids out on Teutonia will see this and will weap tears of joy for all the good it will do them. Incredibly thorough breakdown of the streetcar proposal and the specifics it will entail. Thanks sincerely for sharing.